PhpED is the Integrated Development Environment for PHP (PHP IDE), HTML, CSS, XML, SMARTY, XHTML and other. As in any complicated process, in php development a great deal of effectiveness depends on your choice of production tools. According to our customers, PhpED 19.1 saves up to 75% of development time. Code creation with our PHP IDE got a lot easier with the new PhpED 19.1 editing features. With PhpED's new highlighting abilities you can now navigate through your code easily and save the precious developing time. 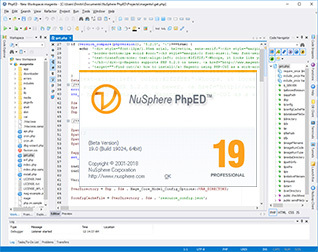 PHP Code Folding sets NuSphere PHP IDE apart from all others. Secure, fast and flexible publishing of your PHP scripts to a remote server right from PHP IDE. All major protocols such as FTP, FTPS, SSH/SFTP, and WebDAV are supported. See the list of major features in PhpED. Striving to meet the growing customer needs, NuSphere enhanced PhpED with features customers ACTUALLY ASKED FOR.